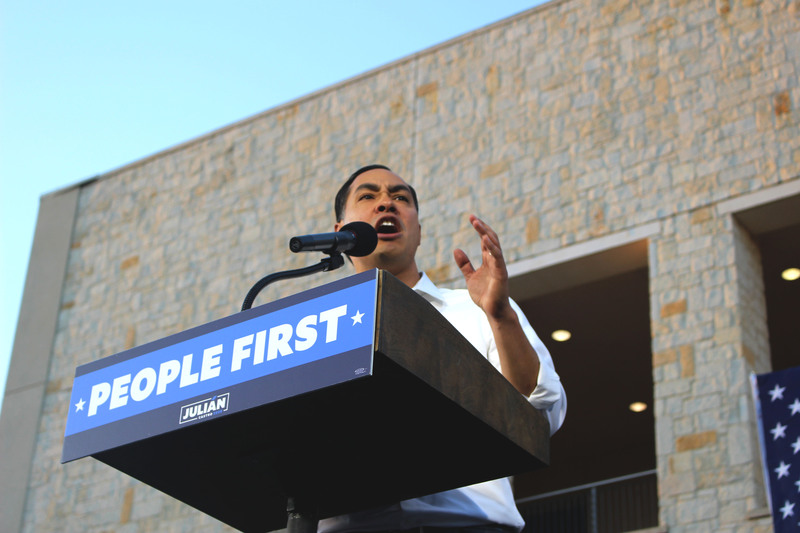 Last week, former San Antonio mayor and current Democratic presidential nominee, Julián Castro, held a campaign rally in Hemisfair park in response to President Donald Trump’s San Antonio fundraiser held earlier that day. At the rally, Castro drew cheers from his supporters when he scorned the president’s immigration policies and proudly made his case for becoming the first Latino president. Castro is one of 15 Democrats who are vying for the Democratic nomination. While he has an impressive background in public service and has provided a comprehensive immigration proposal, Castro is currently trailing the majority of the Democrats in all major polls. Castro has great potential to prove to voters that Donald Trump is not worthy of a second term, but he has yet to prove to voters that he is the ideal candidate to defeat President Trump. Castro has repeatedly said that he’s aware that he is not the front-runner in this presidential race. He adds that he has never been a front-runner and that many Americans can relate. Castro’s acknowledgment that he has yet to capture a significant amount of attention is an honest and expected message from a candidate who has been unable to capture more than one percent of polls. Still, Castro is unwavering in his optimism and certainly does not fail to provide a compelling argument against the president’s policies. Rather than perpetuating the echo chamber of progressive ideologies that come from the rest of the Democratic ticket, Castro has unveiled his own “People First” comprehensive immigration proposal. This substantive proposal includes the reversal of Trump’s cruel, family-separation policies; provides a pathway towards citizenship for DREAMers and 11 million undocumented immigrants living in the U.S.; and establishes protected borders that do not treat immigrants and asylum seekers as criminals. Castro has barely secured a spot on the stage for the first Democratic primary debate in June by satisfying one of two official requirements: gathering at least one percent of support in three polls. The other official requirement, which Castro has yet to satisfy, is to accrue at least 65,000 individual donations. According to party rules, a candidate needs to satisfy at least one of these requirements; however, the stage is becoming increasingly crowded which may cause the party to require candidates to satisfy both requirements to participate in the debate. If more candidates enter the race and Castro’s fundraising numbers do not improve, Castro may miss an opportunity to prove himself as a serious, viable candidate. Despite the progressive policies that have established Castro as a noble candidate, he has yet to be considered a serious challenger that can defeat President Trump. However, he still has time to capture the attention of America and possibly become a front-runner, but time is running out for Castro. Every day that he calls himself a non-front-runner, the actual front-runners are accruing more money, notoriety and support. Meanwhile, polling for Castro remains stagnant.